Never Enough Nails: OPI Top This! Top Coat Set Swatches! Sorry for the silence around here this week! My dad has been in the hospital and had surgery yesterday, so between visiting him and work, it's been impossible to get any blogging done. The surgery went well though and hopefully he'll have a smooth recovery. Today's post is one of the many awesome gift sets OPI released for the holidays this year, OPI Top This! Top This! is a set of three top coats, the regular shiny OPI top coat, OPI matte top coat and a glitter topper, OPI Snowflakes In the Air, that is exclusive to this set. I really like a lot of the OPI gift sets this year. For one thing, the packaging is really cute. The cardboard on this box has a kind of golden sheen to it in person and a quilting effect as well. I swatched OPI Matte Top Coat over OPI DS Temptation first. I've wanted to try Temptation matte since I got it and it looks gorgeous this way. The OPI matte top coat is really nice, it definitely provides that frosted glass effect that I am always looking for in a matte top coat. It's a good matte finish, maybe a bit satin-y rather than flat wall paint looking. I am psyched to add this matte top coat to my collection, I'll be using it quite a lot. This is just one coat of OPI Matte top coat over two coats of Temptation. There was no need for a second coat of the matte. I found this matte top coat dries a little bit slower than others in my collection (China Glaze, KnockOut Cosmetics), but I think that is a good thing. Sometimes, matte top coats dry so quickly that you can't work with them and smooth out any lumps and bumps. This matte top coat was easier to work with and allowed me to get a nice smooth finish. I then used the shiny OPI Top Coat to make Temptation shiny once again! The fun of this top coat set is going back and forth between matte and shiny. I think it would make a great present for that friend who is already into nail polish, but maybe doesn't have a large top coat collection. The OPI top coat is not a fast dry top coat, but it didn't seem like it took forever either. I often use non-quick dry top coats, because the wear time with QDTCs for me personally is horrific. I would say the OPI top coat dries way faster than Zoya Armor, faster than CND Shiny, and about the same as Sally Hansen Complete Salon Manicure top coat. I also find it shinier than all three of those. I'm not sure why, but I haven't owned a bottle of OPI top coat before. I'll be excited to really test it out and see how it wears. This gorgeous holiday treat is two(ish) coats of OPI Snowflakes In the Air over OPI Incognito in Sausalito, topped with OPI Top Coat. 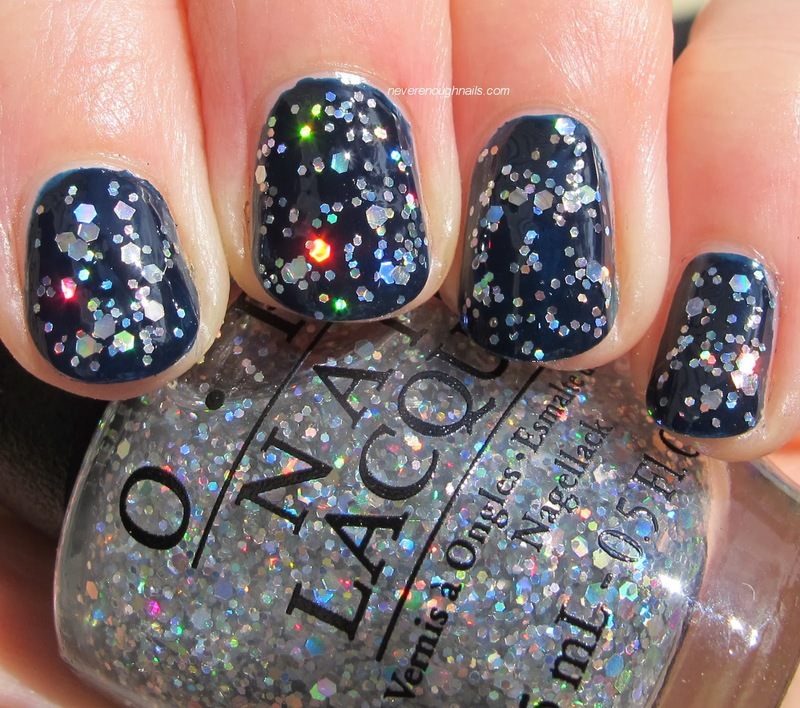 Snowflakes In the Air contains small and medium holo hex glitter in a clear base. 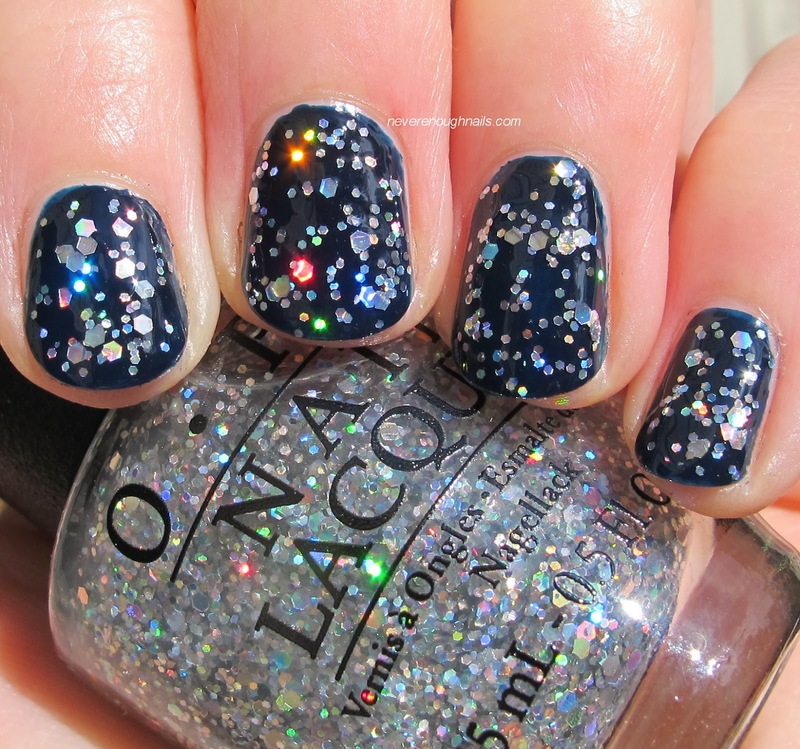 It is the perfect holiday glitter top coat. All of these glitters are holo, so you can imagine all of the rainbows in person! There is a lot of glitter in Snowflakes In the Air, and this is mostly one coat. My middle nail is one coat, but the other nails each got a tiny empty space on them, so I went back and dabbed a glitter or two on there. That's why I say "two(ish)" coats. But the glitter is nicely suspended in the base and you do not have to fish for anything. Like other glitter-heavy polishes, Snowflakes In the Air has a slightly thicker base, but it was not a problem at all. It actually made application easier. I think even people who struggle with applying glitter will find this to be pretty effortless. Of course, I had to try topping Snowflakes In the Air with the matte top coat. 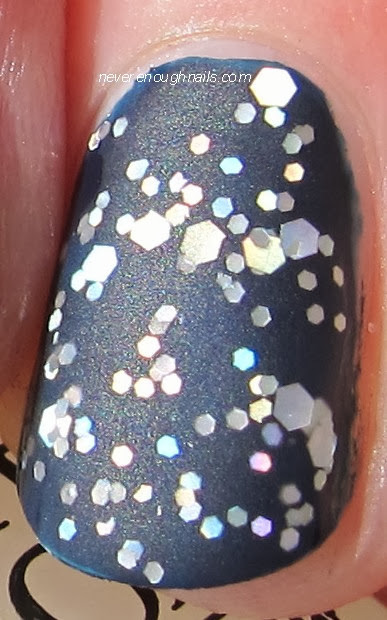 Although this dulls the holo effect, I still really like it and now it looks just like snowflakes! I want there to be another blizzard like last year so I can wear this combo while snow pours down outside. Overall, I had fun with this top coat set and I do think it would make a great gift, either for your polish loving friends or just for yourself. If you don't already own the OPI matte and regular top coats, but have been wanting to try this, this is a good opportunity. And Snowflakes In the Air is just stunning! 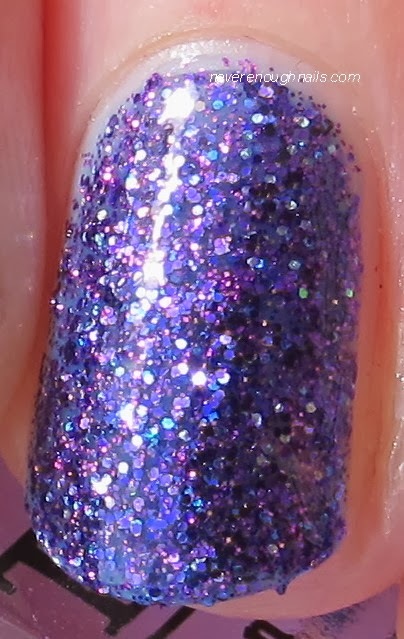 Hopefully, I can soon resume blogging as usual, because I have a TON of cool stuff to swatch. I can not wait to try the OPI Holiday Liquid Sands!! OPI Top This! is available now at professional salons, including Beauty Brands, Beauty First, Chatters, Dillard’s, jcp Salons, Pure Beauty, Regis, Trade Secret, ULTA and ulta.com. Top This! retails for $27.00 ($32.85 CAN).